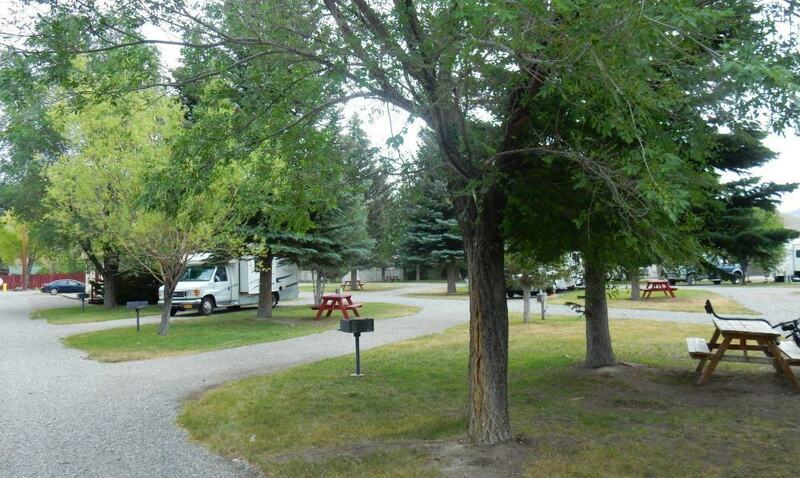 Mountain View RV park in Arco, Idaho is one of those parks that breaks the mold a bit and shows the initiative and personality of its owners. It is a small park but has its own restaurant with a modestly upscale menu and yet features roadside decorations like a ceiling covered with signed dollar bills from travelers who have eaten there. There is even a small 9 hole miniature golf course on site. There are plenty of shade trees and the grounds were well kept. Mountain View RV is located in the small town of Arco, not far from Craters of the Moon National Monument, which is what brought us to town. The town is small enough that it has few national chains but large enough that it has a decent grocery and other useful shops for travelers. Mountain View RV is likewise on the small side but has most of what you might need as well as a few extras. The lots were nicely sized and the grounds well kept. They have the usual laundry, bathrooms, showers, and hook ups, though they aren’t equipped for 50amp power yet, only 30amp. This meant we had to run only one AC unit at a time and otherwise be a little careful with what appliances we ran while cooling the trailer down. Since it got up to near 100 degrees while we were there, cooling down was important to us. Here we are in our spot at Mountain View. Plenty of room for our rig. We never ate at the restaurant but it was clear they took some pride in it. They serve wine, and steaks, and BBQ Ribs and other high-end road food along with other items kids might like. The table settings are fairly nice and overall it had a nice vibe to it. The ceiling was decorated with mosaics made from dollar bills left by prior travelers. We didn’t eat there, mostly just because we were saving money on food, but were that not the case I would have happily tried it out. The facilities were in good order. The showers were small but the water pressure was impressive and the hot water plentiful so I’d give it a big thumbs up. Overall the park was well maintained and clean. I was really happy to see they had a small miniature golf course on site. Nothing too special, but I have a soft spot for playing once in a while. The course was definitely showing its age but it was playable. Trail crushed by 8 strokes on the 9 hole course when we played. The wireless was standard for parks. It worked nicely when most of the folks were not in their trailers and took a nose dive in the evenings to become nearly useless. Ultimately I’d say the price was a bit high for what was offered, but not exorbitant.